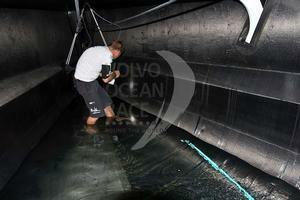 Major damage sustained to Team Sanya during leg 1 of the Volvo Ocean Race 2011-12. Photo Andres Soriano/Team Sanya/Volvo Ocean Race. After surveying the damage at the port of Motril, where Sanya suspended racing just hours after the start of Leg 1, the team soon realised the difficult logistical challenge of getting the boat to South Africa for the next point scoring opportunity. Today, skipper Mike Sanderson said he was relieved to announce to his fans, sponsors and suppliers that a solution had been found and Sanya Lan should be race ready for the December 11 start date. The boat will be loaded onto a Volvo truck this Friday and transferred from Motril to the commercial port at Gibraltar, where she will board a Maersk Line ship and depart on Sunday evening or Monday morning for Cape Town. A truck, ship and crane ride later and the damaged Sanya Lan hull is set to arrive in Cape Town around November 27 or 28 where a newly constructed replacement bow section will be fitted in a rebuild operation that will take place around the clock. The team will have to achieve what is typically a two to three week rebuilt in just one week in order to meet the leg start deadline. Skipper Mike Sanderson said his team remained positive they could achieve the massive task ahead and emerge all the stronger for it. "We have to use this time to come back stronger and fast," he said. "If we keep fighting hard, I have no doubt we will have some wonderful success with this group. Next stop – Cape Town." Team Sanya chief operating officer David Duff, shore manager Nick Bice and rigger Frano Tregaskis will travel with Sanya Lan to ensure a smooth run, along with Media Crew Member Andres Soriano, who will document the transit. Sanderson will head for Cape Town this weekend, along with members of his crew who had headed home for a brief rest and recuperation before heading to South Africa.